As Johan and I begin to take over development of Greasemonkey, one of the important questions we need to answer is: which platforms should we support? We can inform this decision with some of the usage statistics that Mozilla Add-Ons gathers. So, let's say first off: we know this is a bad measurement. There's (almost) no "other" because there's no official support for other platforms, so only third party alterations make this usage possible. Thus, this data doesn't help us answer (i.e.) "Should we support Flock?" or "Should we support SongBird?". It does let us know a little bit about what versions of Firefox we should support. All of 1.0 and 1.5 make up only 0.23% of the user base. Firefox 3.0 and 3.5 make up 95.44% of the user base. Firefox 2, however, makes up 4.31% of the user base. That's a much harder call. Hackers: The raw data and charts behind this post is available on Google Docs. You can also see the python script that turned AMO's raw data into this presentation. There is no reason other than inertia to use Firefox 2.0. 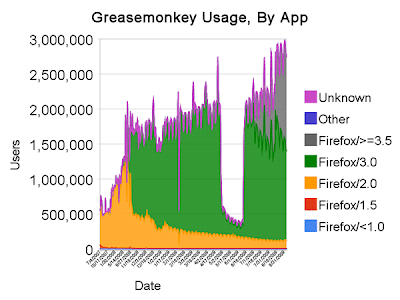 Greasemonkey is for power users who can be expected to upgrade. 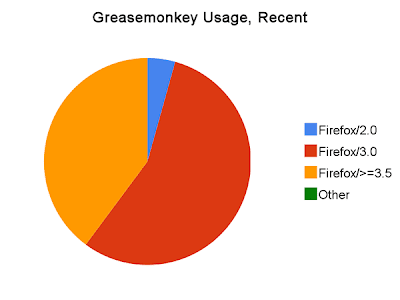 "Greasemonkey is for power users who can be expected to upgrade." Exactly my thoughts. Don't support older versions, I say. Focus on fixing all those bugs and requests instead. I say drop FF2 support, and we still cover ~95% of the users, and they still have older versions to use, that's a decent situation. Hi, firefox recently updated and Grease Monkey will not load. Will there be an update soon? but frankly, chrome is the way of the future. I absolutely love this addon :)I've updated my firefox to the current 3.5.3 version but greasemonkey doesn't seem to work :( Am I missing something? Greasemonkey 0.8.20090123.1 could not be installed because it is not compatible with Firefox 3.5.3. Could it be possible that User Agents Switching could possibly screw the results up? Chrome will never be the future unless it implements an addon system, fixes it's tab system, stability issues, and makes a better theme system among others, but why wait on Chrome when we have a great browser already? Chrome may end up being the future, but not until it catches up to the present. Hey, at least it beats Internet Failsplorer.